Local Trust - Can communities and public services work together? We hosted a roundtable debate at the RSA to explore the benefits and challenges of communities and public services working together. The event was attended by people involved in Big Local, academics, and voluntary and public sector professionals. The debate provided insights into how collaboration can help create positive, lasting change for communities, where residents and local volunteers are encouraged and supported to take the lead and collaborate with public services; particularly with local authorities and commissioners as well as those who deliver services. This is a summary of what we found out, and you can also download the full summary as a PDF. It makes sense to create good working relationships between local authorities and communities. On-the-ground knowledge from communities can create better, more informed decision making. Expertise from local authorities can help community-led projects succeed. But to establish a meaningful two-way dialogue, adequate preparation needs to take place. It takes time to build trust and ensure everyone understands each other’s priorities. Local authorities benefit from resident involvement at an early stage, even if it appears to slow down the process. Starting conversations with a blank canvas is powerful. Good public services don’t assume they know what communities want; they engage, consult and involve communities. The most successful partnerships are those that invest time to establish shared goals and a clear sense of what they are trying to achieve. For both public services and communities, there are barriers to collaboration including past negative experiences of working together. Communities can feel disempowered or be cynical about politics. Equally, some elected members and councillors or public service providers may have concerns about whether residents will work with them, and some might be uncomfortable about giving more say to unelected groups. More open-mindedness and trust is essential on both sides. Residents must not reject collaboration due to negative experience in the past, they need to be open-minded and help public services achieve success. Elected members and those working for public services must not see it as undermining to have residents involved: good working relationships with communities helps achieve more. Establishing regular meetings between community groups and public services working on similar issues helps build trust: and it takes time. Reduced public spending makes relationships between residents and public services even more vital. Enterprising changes are taking place; some public services are being delivered in more innovative, collaborative ways. Some local authorities are going through radical change to deliver services with less funding, and are working in a more collaborative way with charities, communities and others. However, collaboration must be resourced so that people and organisations can work together to find solutions and permission needs to be given for it. Joining up the dots between local authorities, communities and private sector can lead to new solutions. In some cases money isn’t necessary: the conversation creates more solutions. However, many in local authorities face time restraints and budget reductions; lacking time to develop relationships, collaboration and build trust. Political leaders nationally need to encourage local authorities to spend time on building relationships within their communities to find ways to meet local need and build on local assets and opportunities. Places without an existing pool of community-minded, can-do residents, and active community based groups may be at a disadvantage if there is new reliance on communities to ‘step forward’. We need to resource and support collaboration everywhere. 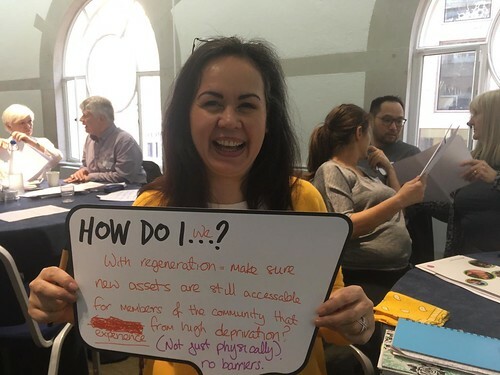 Collaboration works best where residents are more active, and we need to ensure a diverse section of residents are able to participate, rather than just the ‘vocal few’. Maybe it is the politically literate who get involved, or involvement only happens if a key service is challenged. Some communities have capacity, but others find it hard to gain resident involvement. Those working with and for communities need to help develop residents’ capacity and confidence to take the lead. Communities flourish if people learn how to be citizen activists for things they care passionately about. Time is needed to genuinely create confidence amongst residents that enables them to make their voice heard and make a difference in their community. In addition, we need to ensure a range of people are involved and engaged to reflect those in each community. Some residents feel participation brings too much responsibility, takes too much time and resources. We need to be mindful of this and take it into account, for example by providing a variety of ways for residents to be engaged; including the opportunity to ‘drop in and out’ so they do not feel obliged or deterred from becoming involved. 1. Commit to the time it takes to establish collaboration. 2. Be open-minded to restore trust and confidence in each other. 3. Resource collaboration: it is a powerful solution in the current financial climate. 4. Help residents build their confidence and skills to improve their community. 5. Be patient – better to spend more time giving people what they want than to waste time, money and effort on what public service providers assume local people want. Let us know what you think; what you have learnt; what works and what doesn't. We’d be pleased to exchange blogs and speak at events together on this topic. Learning from each other, sharing stories of partnership working (successful and unsuccessful) will help create a more collaborative future for all communities and all public services. Contact us by email. We also ran a survey to find out what local authorities and local volunteers think about collaborating together. We found a high level of support for collaboration, and learnt more about what helps it to succeed. View survey findings. To explore some examples of collaboration in Big Local areas, click here.